Happy Banned Books Week! For those who don’t know, Banned Books Week is an opportunity to celebrate the freedom to read and to stand up against censorship. As the American Library Association describes it,”While books have been and continue to be banned, part of the Banned Books Week celebration is the fact that, in a majority of cases, the books have remained available.” As libraries and schools are most often the battleground for challenges to books, this week is an excellent time for libraries and schools to shine. In honor of Banned Books Week–and in the hopes of spreading information about the purpose of the week–I have a pop-up maker event planned around the theme. We often talk about the importance of partnerships on MakerBridge, and in this situation, I was lucky enough to form a partnership with the Creative Writing Department on campus. In the past, Creative Writing has held their own Banned Books Week event, including readings from participants’ favorite challenged books. This year, we’ve joined forces, which is excellent on a number of levels, including increased participation, attention, and advertising. Button-making. We’ve featured this idea in the past on our blog. I recently got a button-maker and I’m excited to let students, faculty, and staff really get their imaginations going. Making buttons from images of book covers is also a great opportunity to teach about which books have been challenged and why. Stickers and bookmarks, for which I’ll use my Silhouette Cameo. Similar to the above, this is a creative and fun way to both celebrate and learn. In fact, while pre-creating some bookmarks to hand out, my student assistant started asking about the different books featured and wondered why they had been challenged. Banned Books Week was a new concept for him, and the act of creating piqued his curiosity. Simple handmade journals. What better way to promote anti-censorship than to give people a vehicle for their own voices? The freedom to read and take in new ideas should also include the freedom to create and spread ideas. I’ll be giving this Instructables project a try with some paper, cardstock, and my sewing machine. 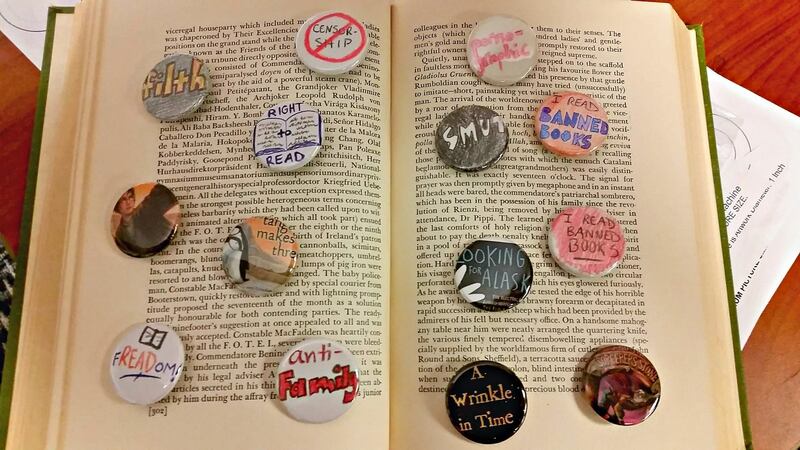 What other creative projects have you used to celebrate Banned Books Week? Does your school or library mark the occasion, and how so? Share your ideas and your stories in the comments or on Twitter!